The Tolkien Estate recently announced that J.R.R. Tolkien's translation of Beowulf will be released in May. Since there seems to be a little bit of incorrect information floating around the web (thanks in part to some careless work by more than one reporter for British newspapers), I figured I should clarify things. First, I have nothing to do with this edition. I did work on Tolkien's Beowulf translation about ten years ago and was putting together an edition along the same lines as the one the Estate has described, but the Estate withdrew permission for that project and I have done no new work on it since then. Second, I did not "discover" the Beowulf translation, not even in the sense that I found it in the Bodleian Library. This claim is a conflation of a story about one manuscript with information about a totally different text. The real story is not quite as exciting. I went to the Bodleian Library in 1996 to finish up my dissertation research, which included work on the evolution of Tolkien's 1936 lecture "Beowulf: The Monsters and the Critics." From the catalogue in Modern Papers I knew that there were notes and drafts of that lecture in MS Tolkien A26. What I did not know was that not only did the box of manuscripts contain marked-up carbon typescripts and proofs of the British Academy lecture, but also two substantial handwritten texts that were Oxford lectures about Beowulf written in the 1930s. These lectures were obviously preparatory to "Beowulf: The Monsters and the Critics" and were quite a bit longer and more elaborate than that text. These were what I "discovered," not Tolkien's translation of Beowulf (which I actually did not examine). Obviously a text preserved in a library and mentioned in its catalogue is not a "discovery" in the sense that it was ever "lost," but it was a discovery to me and also, as best I can tell, to Tolkien scholarship and Anglo-Saxon studies, since neither I nor the field knew that such lectures existed. Although Christopher Tolkien obviously knew what they were when he donated the manuscripts in 1986, as far as I know, no mention of the lecture drafts had appeared in any publication in the decade between the donation and the date I read them. So that's was the "discovery" I was talking about. The Tolkien Estate very graciously gave me permission to have the texts microfilmed and to quote from them in my 1997 Loyola Chicago Ph.D. dissertation, and after I successfully defended and had started teaching at Wheaton, the Estate gave me permission to produce the edition that became Beowulf and the Critics, which was published in 2003. [Note: the release of the edition was absolutely not timed to coincide with the Peter Jackson films, and there was no coordination at all with the Estate. In fact, my publisher had the manuscript for over two years before the edition appeared. I was nagging them to try to get the book released in time for The Fellowship of the Ring (and my tenure case! ), but the queue of previously accepted works was so long that Beowulf and the Critics was not released until around the time of The Two Towers, and then they printed only 300 copies, so it sold out in about a week and new copies were not available until after the hype had passed. My total royalties from the edition have been something like $75.00 -- though I haven't received a royalty statement in a few years; I should check. The Tolkien Estate's total royalties have been $0.00. So much for the claim that Christopher Tolkien allowed the edition to be published for financial reasons]. In 1999 (I think), I had traveled to Oxford to proof my edition of Beowulf and the Critics against the manuscripts. While there, I had a very pleasant meeting with the Solicitor for the Tolkien Estate and expressed my interested in producing an edition of J.R.R.T. 's Beowulf translation and commentaries. The Tolkien Estate arranged to have all the manuscripts microfilmed and sent to me, and I ended up doing a "feasibility study," proposing an edition that combined the partial verse translation, the complete prose translation and the commentaries. The Tolkien Estate approved this project, and I began working on my edition in early 2002. Important Note: I did not "discover" Tolkien's Beowulf translation and never made any statement to that effect. The existence of the Beowulf translation was known to Tolkien scholarship long before 1996. Some of it had appeared as early as 1940 in "On Translating Beowulf," and two passages (one verse, one prose) were quoted by Wayne Hammond and Christina Scull in J.R.R. Tolkien: Artist and Illustrator. The translations, MS Tolkien 29, were identified in the Bodleian Library's Modern Papers catalogue, and their existence and possible quality were at least a tangential topic of conversation among Anglo-Saxonists at ISAS 1995 at Stanford. Furthermore, I have never seen or touched the physical manuscript of the Beowulf translation, having done all of my work from the microfilms sent to me by the Estate in 2002. In 2003, my college put out a press release about my work on Tolkien in which the publication of Beowulf and the Critics was announced and my continuing work on the Beowulf edition was mentioned. On the day after Christmas in 2003 (I think), just after the release of Beowulf and the Critics, a reporter from a British newspaper called me to follow up on the press release. Having had no serious experience dealing with the media, I spoke to him unguardedly and for a long time. I was very excited about the publication of my first book, and I also talked to him about the new project that I had begun. Several days later the story "Tolkien's Last Great Work is Discovered" appeared on page 3 of the paper. The reporter had conflated my story about the Beowulf and the Critics lectures with the Beowulf translation, and then it was off to the races. Because of the hype surrounding The Two Towers film, the story went global, with well over a hundred newspaper articles appearing. Interestingly, exactly zero reporters contacted me about the story in that first rush of stories, as everyone simply lifted the quotes from the original article but wrote as if they had interviewed me themselves (important lesson about journalism). By New Year's Eve things had gotten out of hand, and I faxed the Tolkien Estate asking for guidance. They were not happy, especially because they thought I had given a copy of the unpublished translation to the reporter. I was confused by and angry at being accused of leaking the translation, and it was only after quite a bit of mutual misunderstanding that I understood that the Estate had not realized that the passage of the translation quoted by the reporter had been one of the papers in MS Tolkien 26 included in the material I published in the appendix. I had pointed the reporter towards this material and then helped him convert my diplomatic transcript into a readable text (by the way, this was the same passage of text that appeared in "On Translating Beowulf," and in hindsight I should have just directed the reporter to that text). The confusion and misunderstanding led to a somewhat rancorous exchange of letters, and the Tolkien Estate withdrew their permission from my edition. I returned their microfilms and have not worked on my edition since then. In the years since, the Tolkien Estate in general and Christopher Tolkien in particular have been very helpful with other projects, from giving Tolkien Studies timely permission to quote from and publish previously unpublished works, to helping me decode J.R.R.T. 's handwriting for the revised edition of Beowulf and the Critics. I am glad that I did not follow the advice I received to pursue legal action over the withdrawn permission but instead focused my energies on other projects. Although I have obviously already read (and edited) the translations themselves, I am still very much looking forward to the release of the book in May. I am interested to see how Christopher Tolkien has put the entire edition together, and I look forward to reading his commentary (especially if it is anything like the excellent apparatus that he created for Sigurd and Gudrún). The above story is not as exciting as "discovering" Tolkien's "last great work" would be, but it has the benefit of being true. And in any event, I now know that the low-level "discovery" of finding something in a box of papers could never come close to the thrill of a real intellectual discovery. Thanks to the "Lexomic" methods our research group has developed at Wheaton over the past few years (http://lexomics.wheatoncollege.edu), I have experienced the joy of recovering information that was lost for over a millennium and making discoveries about Beowulf and other Anglo-Saxon texts (at least one of these discoveries has been confirmed by an archeological find). The pleasure of finding things out is much greater than the pleasure of just finding things. Responding to people who have asked "Who buys physical CDs any more?" 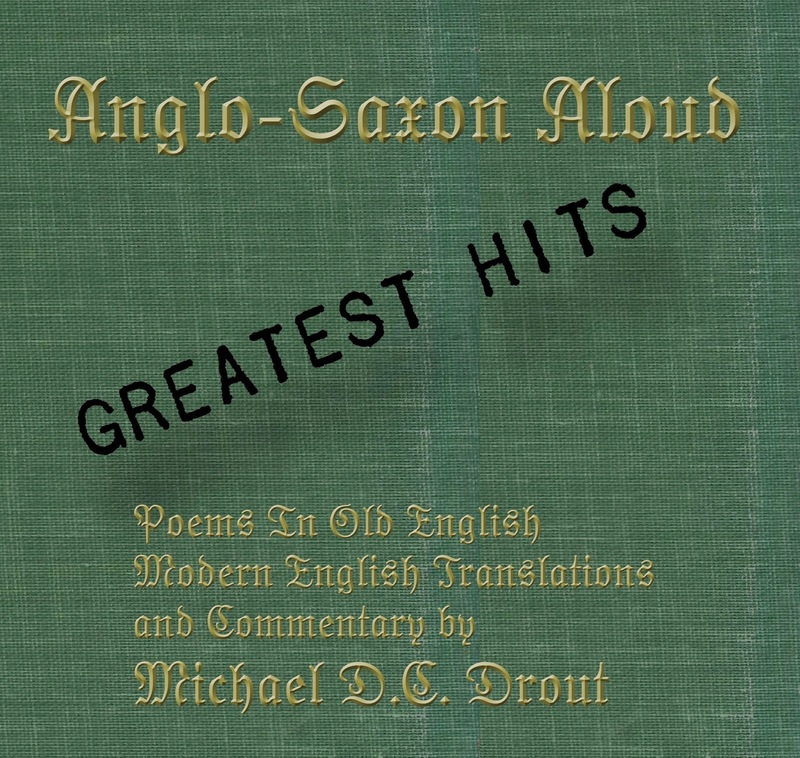 I have put Anglo-Saxon Aloud: Greatest Hits up on iTunes and CDBaby. There is a general introduction as well as explanatory introductions for each poem. I am working on putting up a downloadable version of Beowulf Aloud as well, but right now I only have physical copies for sale of that 3-CD set at BeowulfAloud.com . 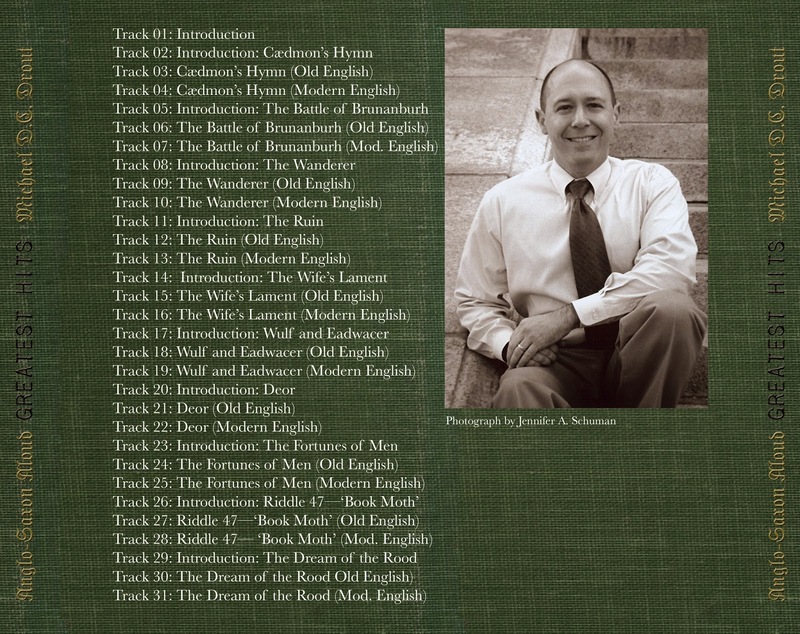 I hope you enjoy listening to the poems as much as I enjoyed translating and recording them. Parent: I'm really proud of my daughter's success in medieval studies. It's amazing how she has learned these languages and knows so much about literature I didn't even know existed. And being a co-author on an academic paper... no one in our family has ever done that. But I'm worried about her majoring in something so specialized. She doesn't want to teach, and the economy is still terrible, and we're not a rich family. She has to get a job when she graduates. Wouldn't it be better to major in Psychology or Business, something practical? What is a degree in medieval studies going to do for her? Professor: Show potential employers that she is really, really smart. Professor: I'm completely serious. Success in medieval studies is incontrovertible evidence of intelligence, self-discipline and the ability to solve complex problems. * Employers aren't allowed to give IQ tests (which don't really work that well, anyway), but they want to hire really smart people. Medieval studies is a big, bright flag that says "Smart Person Here." Joking aside, it's probably a safe bet that any undergraduate who can do original research in a centuries-old academic discipline dominated by prickly Oxbridgians, grumpy Germans and in-bred Ivy-types is going to be able to handle something like banking or administration. Parent: That's a really good point. Parent: [sounding frustrated] Why don't liberal arts colleges ever just say that? Why all this vague "critical thinking" stuff that is obviously b.s.? Professor: Colleges are run by administrators, not medievalists. Administrators like vague phrases like "critical thinking," because the same group of words can mean different things to different constituencies. So "critical thinking" can mean "criticizing aspects of current social organization" to the people who care about that stuff and "being able to think in a disciplined manner" to people who care about that stuff. But the very vagueness that makes the cliche appealing to administrators robs it of rhetorical power. * Two of my student research partners, both of whom concentrated in medieval studies and wrote honors theses on Anglo-Saxon topics, recently graduated from a top-25 law school. They didn't study pre-law or political science but were nevertheless perfectly prepared for the academic challenges. Why? Well, honestly, mostly probably because they're both ridiculously smart and self-disciplined, for which their parents get the credit, not me. But also because medieval studies prepared them to handle complicated, ill-defined problems--just like the kinds of things they had to deal with in law school. The difference? The law-school problems are all in Modern English, so they're a bit easier. Also, their undergraduate focus in medieval studies demonstrated to law schools that they were extremely smart, which helped get accepted into an elite school in which they could then prove themselves.